I really love all the colours I chose to go into this mani. I knew I wanted something that vaguely inspired Valentines-y thoughts (hence the roses and the pink) but I didn't want to go full-on hearts. I thought this was a great middle ground that still stuck with the theme. 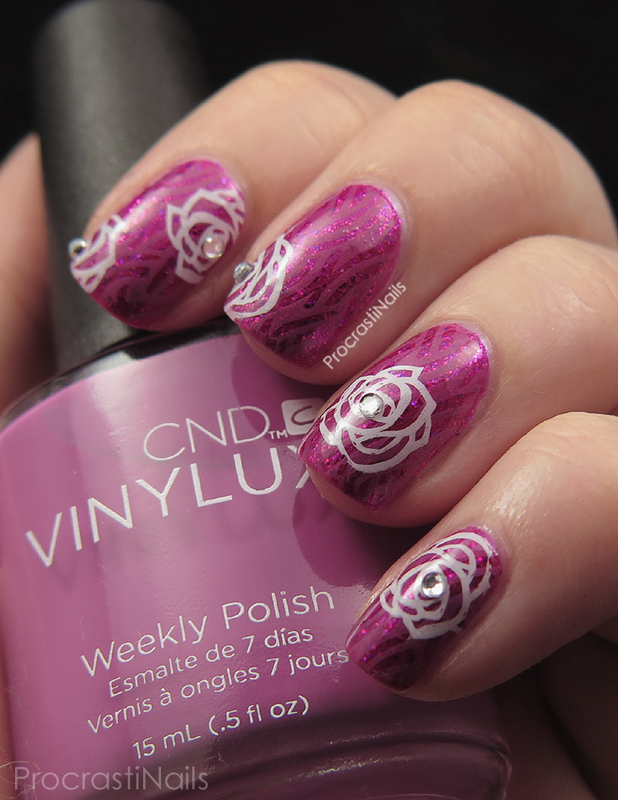 My base is CND Vinylux Butterfly Queen with a subtle design stamped on top with CND Vinylux Crushed Rose and BP-30. 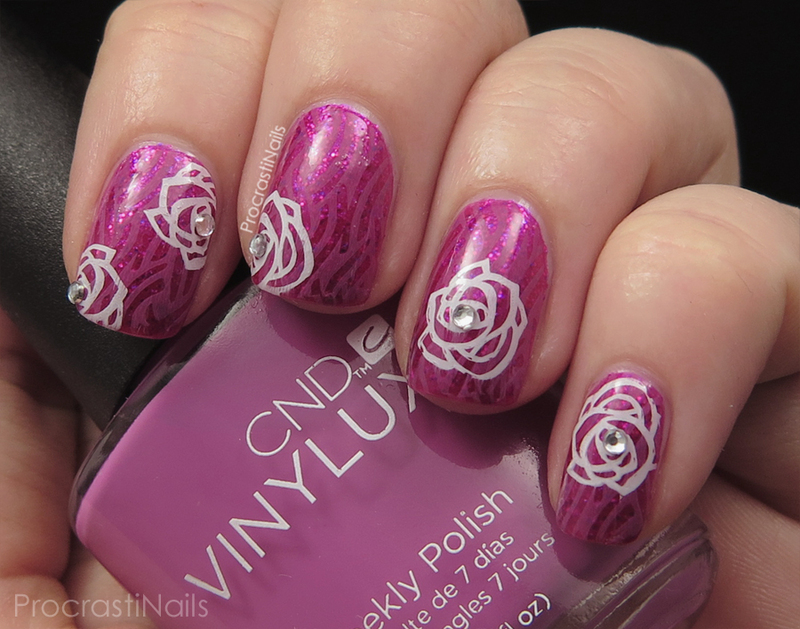 My actual roses were done with Konad White Stamping Polish and the same plate and I finished it all off with some clear crystal gems in the middle of each rose. 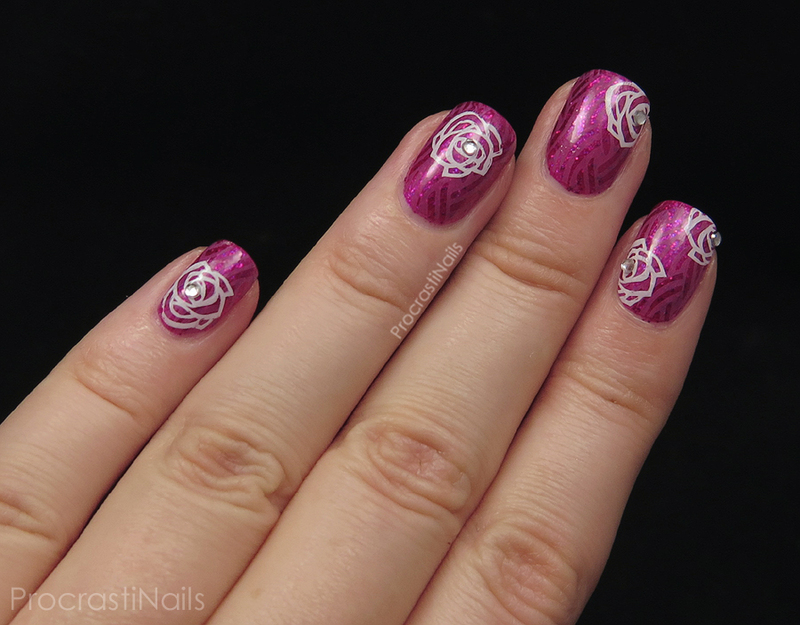 I purposefully wanted my base to have some subtle stamping to add something extra between the base glitter and the rose without hiding much of that gorgeous glitter. 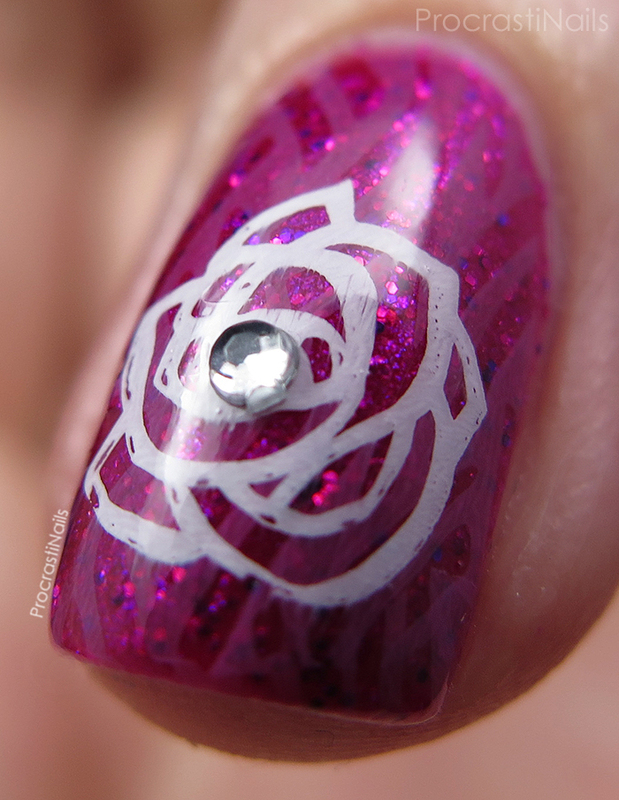 This shot really shows off how stunning Butterfly Queen is, peeking out from under the stamping. I didn't even realize there was purple glitter in the polish until I took a macro! I was suprised with how well the CND polish stamped! I guess it makes sense since the line seems to be more or less opaque with one or two coats (which is the hallmark of a good stamping polish) and I'm looking forward to trying out the other colours in the collection with stamping, too! Let me know what you think! 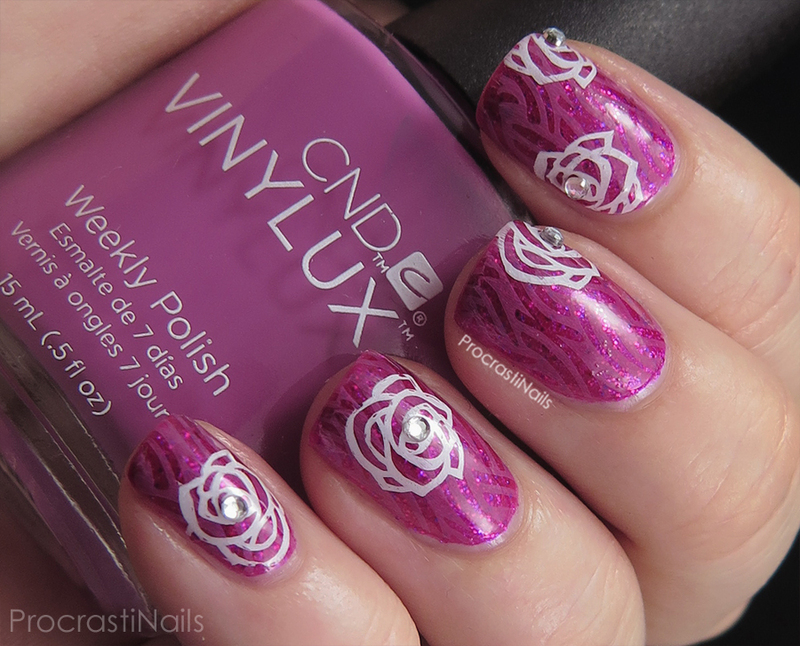 :) Have you ever tried stamping with CND polishes? Love that base color, and how you soften the look with the stamping! Love the stamping happening on the nails. I just love how this turned out! How exciting for you that you were invited to the launch!! I love the stamping over the glitter - it looks like it's almost floating. These are so pretty!! I love the glitter underneath! I love the depth of this layered stamping! It is beautiful! Love the addition of the rhinestones and the subtle double stamping! Beautiful mani. I like how it turned out. I love the rhinestones you added, it's perfect for the roses. The layered stamping is so pretty! And the rhinestones are the perfect touch. That base colour looks awesome and I love the double stamping! Wow, this double stamping is amazing!!! I really like the subtle background stamping you did with this.